If you don’t find the answer to your question here, please contact your nearest Big Green Egg dealer or Customer-Support@BigGreenEgg.com. The Big Green Egg is available in seven convenient sizes and, with the addition of a Nest, Table or Custom Island, can be configured in many different packages — designed by you to meet your specific needs. Many dealers also offer their own suggested packages that include all of the most popular configurations. For pricing on specific EGG packages and EGGcessories, please contact or visit any Authorized Big Green Egg Dealer. Click Here to locate dealers in your area. To help make it easier finding answers to your questions, we separated them into sections. There are a lot of EGGcessories that I would like to try. Where is my closest dealer? You can use the Find a Local Dealer tab on our home page to locate Authorized EGG Dealers in your area, or around the world. Why can't I buy an EGG on the internet and have it shipped to my house? 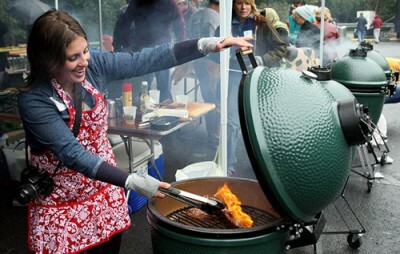 Like many specialty products, the Big Green Egg is currently available exclusively through a network of distributors and Authorized Dealers who are knowledgeable about the EGG and its many features and pride themselves on customer support. Discount Clubs, On Line Stores and other similar entities are not Authorized Dealers, and are in effect reselling products they have acquired elsewhere. Big Green Egg does not recognize or offer a warranty on any EGG purchased from an unauthorized online reseller, so be wary of anyone claiming to be an online Big Green Egg dealer. Where can I find pricing for EGGs and EGGcessories? How do I become an EGG dealer? Please use the Become a Dealer feature on our website to contact us. Big Green Egg is seeking qualified dealers in many new market areas, and there are exciting opportunities to join the Winning Dealer Team at Big Green Egg! Be sure to visit our Getting Started page! I used lighter fluid in my EGG and it now smells. What can I do? If you have used lighter fluid in your EGG, you will need to light your EGG to 500°F/260°C and conduct several non-cooking cycles (no food) for approximately one hour each to burn off the lighter fluid and lighter fluid odor. The convEGGtor is used for indirect cooking on the Big Green Egg, providing a barrier between the food and the flame and turning your EGG into an outdoor convection oven. The design of the convEGGtor allows heat to radiate within the dome while preventing the direct heat of the fire from reaching the food. Nothing will contribute greater versatility to your outdoor cooking than adding aconvEGGtor to your EGGcessories collection. Why can't I get the temperature in my EGG over 350˚F? If you think your external temperature gauge is reading incorrectly, first make sure the holes in the Fire Box are clear and that there is a proper load of charcoal in place; reduced air flow or not enough charcoal can lead to low temperatures. To calibrate the gauge, carefully place the stem of your gauge into a pot of boiling water, being careful to not rest the tip of the gauge against the bottom of the pan. Exercise EXTREME CAUTION as boiling water is very dangerous and can cause burns. We recommend holding the gauge with pliers and wearing a heat proof glove or mitt. After about one minute, your gauge should read 212°F/100°C. If your temperature indicator is not at the 212° F/100°C mark, adjust the indicator by turning the nut on the underside of the gauge using a 7/16″ wrench. Rotate nut in direction needed to align pointer at proper temperature and repeat to check your gauge as instructed above. AGAIN, EXERCISE EXTREME CAUTION AT ALL TIMES WHEN BOILING WATER. Can I place the EGG directly on wood or a table? DO NOT PLACE AN EGG DIRECTLY ON A WOOD SURFACE OR ON OR NEAR ANY COMBUSTIBLE SURFACE! The bottom of the ceramic does generate significant heat when in use, and may cause combustion if placed directly on or in proximity to any combustible material. The EGG is designed to be used in a metal Nest or with the metal table Nest, allowing for an air gap below the EGG. Alternately, a concrete paver block may be used to support the EGG when used in a table. For maximum heat protection, a paver block and a metal table Nest can be used in combination. Always close both vents fully upon conclusion of cooking. How much clearance do I need from combustible material? The bottom of the ceramic does generate significant heat when in use, and may cause combustion if placed directly on or in proximity to any combustible material. Do not leave a lit EGG unattended with the dome open. Be aware of dry leaves, decking and other combustible materials that may be in proximity to an EGG while it is in use, as they may present a fire hazard if any hot charcoal or sparks are allowed to come into contact. Do be aware of your surroundings if using an EGG while camping or on cookouts, as any open flame can present a hazard to people and property. Do be aware that local ordinances may specify distance to place any outdoor cooker from a structure or may limit outdoor flame of any type during drought or fire hazard periods. DO NOT ATTEMPT TO LIGHT OR USE AN EGG INDOORS unless it is an approved commercial installation with venting or fire suppression as may be required by building codes. The EGG must always be placed outdoors, away from structures and NEVER inside or in proximity to an enclosed area. The burning of wood and charcoal products releases carbon monoxide, which can be deadly. DO NOT attempt to light or use an EGG near any storage area or inside a garage or enclosed patio that may contain fumes or combustible materials – if you have any questions about such materials, please contact the manufacturer of the combustible material in question. Do you have a cookbook available online? We have something even better! We have a full library of recipes and cooking videos – along with cooking tips – in our Recipes section. Big Green Egg Dealers also offer severalBig Green Egg Cookbook, with extensive color photography and delicious recipes that will help you fully explore the unique cooking abilities of the EGG. Is there a rotisserie attachment available? Can I drill a hole into the EGG? How can I obtain replacement parts that my local dealer does not stock? If your local dealer does not have the parts that you need in stock, they can easily order it for you. If that is not possible, please email Customer-Support@BigGreenEgg.com describing the part you need, along with your contact information and phone number. How do I care for my Big Green Egg Acacia Wood table? Big Green Egg Acacia Wood Tables are fabricated from all-natural kiln dried solid planks of eco-sustainable hardwood, without pressure treating or other preservatives. They have been lightly treated with a UV-resistant finish. It is important that you take care to protect the finish as any natural wood is going to change appearance when exposed to sun, heat or rain. Keeping the table covered and ventilated when not in use is always recommended. A Big Green Egg Table Cover is the best way to protect the finish. Clean the table as needed with a mild detergent and damp, non-abrasive cloth. Standing water can seep through the finish and stain the wood. Keep your table covered or wipe away any standing water. Place table on a hard surface with adequate drainage. Don’t place legs directly on damp grass or standing water. The adjustable leveling feet included with the table (or the optional Locking Caster set) should be used to keep the bottom of the legs elevated above ground. Chemicals, solvents, chlorine and alcoholic beverages can stain wood surfaces. Hot items such as cooking grids, convEGGtors and baking stones can damage the table if placed directly on the wood surface. Check and tighten hardware occasionally. This table is an all-natural wood product – with proper care it will exhibit its beauty and functionality for years to come! How do I clean the convEGGtor and Pizza & Baking Stone? If you experience adhesion issues with the gasket, please contact your local Big Green Egg dealer for a warranty replacement. Minor separations on portions of the gasket can easily be reattached by using an adhesive such as 3M Super 77 or similar hi-temp adhesive. The green glaze has chipped. How do I get touch up paint? My dome does not align with base. My dome has sealed itself shut and cannot be opened. What can I do? CAUTION: TO AVOID A WARRANTY ISSUE, DO NOT ATTEMPT TO FORCE, LEVER OR FORCIBLY PRY OPEN THE EGG AS THIS MAY CRACK OR CAUSE DAMAGE TO THE CERAMIC! Once the EGG is open, inspect the gasket for damage and replace if necessary. Your Authorized Dealer can provide a new gasket. I have XLarge EGG and the Dome only opens halfway? What can I do? My EGG does not fit all the way down into the Nest. What should I do? Do you sell just the dome or base? All components of the Big Green Egg are available and can be purchased from your Authorized Big Green Egg Dealer. I have an older EGG, will the new bands fit? How do I register the warranty on my new EGG? Simply go to the online warranty registration located on the website home page. If you do not have access to the online form, your Authorized Dealer can register the warranty for you. Always keep the original receipt or proof of purchase as only EGGs sold by an Authorized Dealer are eligible for warranty support. Can my dealer handle warranty issues? Yes, any Authorized Big Green Egg Dealer in the country of purchase is able to handle warranty issues. If you have moved your EGG to a different country, you will need to contact the Authorized Dealer in the country where it was originally purchased. What is the warranty on my EGG and EGGcessories? When you purchase an EGG, your investment in this amazing product is protected by a successful company with a reputation for manufacturing excellence, and we are committed to supporting our products with the original limited lifetime warranty and best-in-class customer service and dealer support. Please see our Warranty page for complete information. When you invest in a Big Green Egg you are protected by a company with over forty years of success making the finest product of its type in the world today. What is the warranty on the wood tables? My EGG has a crack in the Fire Box? Is this covered in the warranty? My Temperature Gauge is fogged up, is it under warranty? The Temperature Gauge comes with a one year warranty. Replacement gauges are available at your Authorized Dealer. If the gauge has been exposed to heavy rain or humidity, or stored in a damp environment, this fogging often clears up after exposure to the sun or in drier weather. My dome or base is cracked, is it covered under warranty? Depending on the reason or source of the crack it may be covered under warranty, if it is a structural crack and not from dropping or accidental breakage. Big Green Egg is unable to provide warranty coverage on damage caused by accidental dropping or other similar situations as outlined within the Warranty. The dome releasing from the band can occur due to loose nuts or bolts on the band, or any other number of reasons beyond our control. All hardware on the EGG should be checked and tightened every 30 days, and more frequently if it is used or moved often. An Authorized Dealer may be able to examine the crack and determine the cause, and if not you can Click Here to send a photo and message to Customer Service.